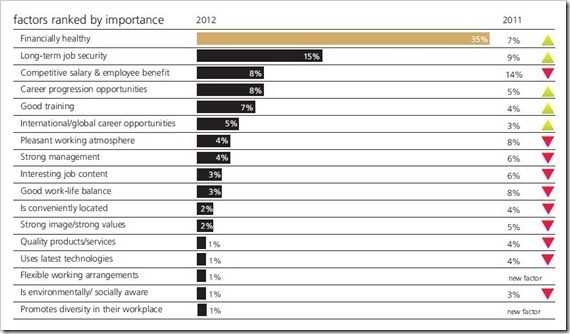 Microsoft was ranked the Most Attractive Employer to work for in 2012 by Global HR services company Randstad. Microsoft has won this award 2nd year running! The survey by Randstad was conducted amongst a large audience of 8,500 respondents from over 150 biggest employers in the country, to find India’s most attractive employer brand. The rankings were based on 10 following parameters like Financial health of the company, Good training opportunities, Long-term job security, Opportunities for career advancement, Strong management, Interesting job content, A pleasant and stimulating working environment, Competitive salaries and employee benefits, A good work-life balance and Progressive policies concerning the environment and society (CSR). So, on what basis do employees find employers attractive? According to the survey Financial Health of the company is the biggest influencing factor – More than 1 in 3 respondents of the survey said that Financial well being of a company was the biggest attractive factor to get employed. It is followed by Long Term job security (15%), career progression opportunities (8%), competitive salary & employee benefits and international career opportunities(8%). products and services, good training and career prospects, whereas women prefer factors such as easy accessibility, flexible work arrangements, pleasant atmosphere and interesting job content. There is a greater concern for strong management, values and image, quality products and good work atmosphere among older respondents while the younger workforce looks for technological innovativeness, good training, flexible working arrangements and global career opportunities. 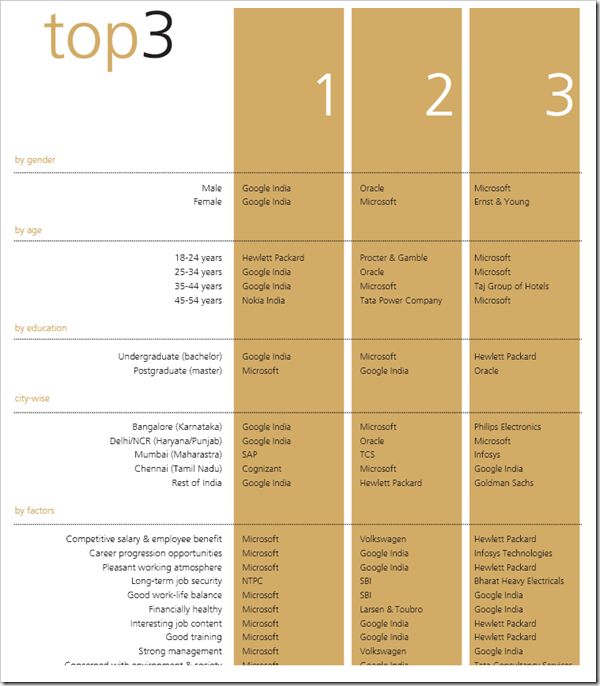 Here are how respondents ranked the Top 3 Indian companies. The results are separated by Gender, Age, Education and Citywise. If you see, most of the respondents ranked Microsoft as the most attractive company for all the factors except Long Term security, which obviously will go to a Public sector Undertaking company. However, Microsoft was a overwhelming winner in all other factors. Google could be rated as the 2nd most attractive company in India followed by Hewlett Packard. For me personally it is a bit surprising that Microsoft has been preferred over Google, which is probably far more financially healthy right now and offer great benefits to its employees! Cleartrip redesigns user dashboard, and its awesome! Airtel launches its own Online shop!